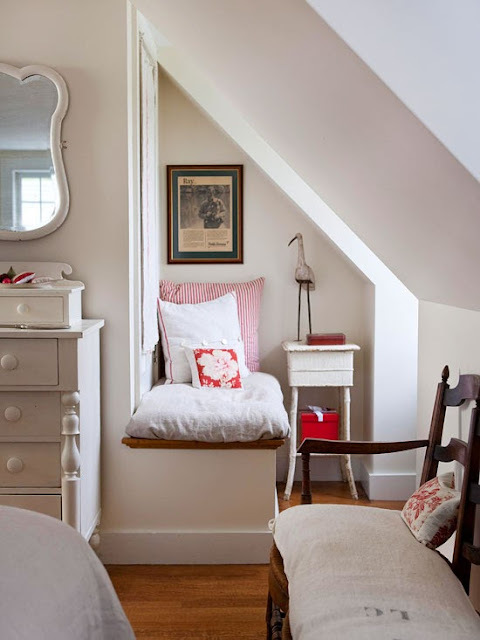 It's pretty amazing how this tiny space under the staircase can be transformed into a cozy reading nook. This is the reason why I love interior decorating a lot! I feel thrilled every time I gather some inspiration for home decorations. Apartment dwellers and those residing in a studio type of condo should try some ideas of extending your space at home. There's nothing impossible if we really try to find solution to our problems. I've also learned through the years that nothing is big or small as part as interior decorating is concerned. Our imagination and creativity will always lead us to something worthwhile. This under the stair case space could also be transformed into an instant book shelf by fabricating your own piece of furniture and make the shelves of the cabinet follows the shape of the space that you want to decorate.